Flowers: solitary; axillary; frequently having three bracts underneath. Calyx: tubular; of five, or more divisions, highly coloured inside. Corolla: of five, or more petals which rest upon the throat of the calyx and appear to form a background for the heavy circular fringe made by numerous outreach-ing rays. Stamens: five, with long versatile anthers, their filaments united to a rod-like stalk that upholds the ovary. Styles: three; spreading; club-shaped. Leaves: alternate; deeply three-cleft; serrated. Stem: woody; branching; climbing by means of axillary tendrils. 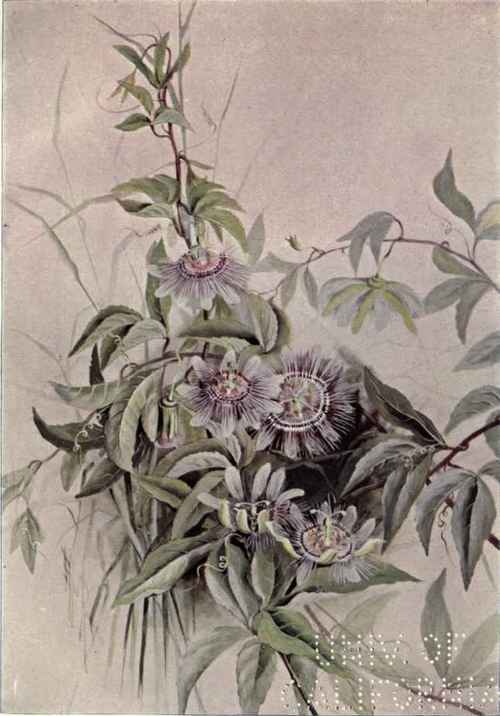 It is in the dense forests of Brazil that the passion flowers are seen in all the majesty of their native loveliness. Their hue is brighter there than elsewhere, the flowers are larger and they have a rare fragrance that is lost to a great extent in the North American species. There, the delicate, curious blossom first attracted the attention of the early Roman Catholic missionaries, who, with fire and sword, were spreading the religion of love and gentleness. To them, it seemed that the flower held before their vision all the dreadful details of the crucifixion.
" The crown of thorns in the fringes of the flowers, nails in the styles with their capitate stigmas, hammers to drive them in the stamens, cords in the tendrils." The sponge and the five wounds of Christ were also pointed out to strengthen the invaders in the belief that their doings were sanctioned by the divine will. The flower is still the one among all other flowers that is held in veneration; for it is associated with the passion above all other conceptions of our Saviour. It remains open but for a single day. P. /utea, yellow passion flower, grows southward and westward from Pennsylvania. Its leaves are very broad and the lobes much rounded.